Tommy James and the Shondells hold on to the top spot on both of our local charts this week ... but I remember a heated battle between "I Think We're Alone Now" and The Turtles' "Happy Together" ... seems like they kept bumping each other out of the #1 spot ... we may see more evidence of this in the weeks to come. "A reporter came up to me in the U.S. and asked what I thought about John Lennon's 'Jesus' quote, when he said he thought The Beatles were more popular. I said that there was some talk about us being more popular than The Beatles at the moment, so where does that put US!?!? I can imagine this guy going away now and writing, 'Davy Jones says he's God.'" New on the charts this week are "Beggin'" by The Four Seasons (this week's top debut at #69), "This Is My Song" by Petula Clark (premiering at #77), the novelty hit "Mairzy Doats" by The Innocence, brand new at #85, the stick-in-your-head "Western Union" by The Five Americans, premiering at #89 and "Bernadette" by The Four Tops, bringing up the rear at #99. Aretha Franklin debuts with her first soul hit for her new label, Atlantic Records, as "I Never Loved A Man (The Way I Love You") premiers at #81. And, speaking of Petula Clark, she performs before England's Princess Margaret at The London Palladium tonight. The Jeff Beck Group, featuring bass player Ron Wood, drummer Aynsley Dunbar and former Long John Baldry vocalist Rod Stewart, make their performance debut in London. Virtuoso Guitarist Jeff Beck, a former Yardbird, would go on to have a stellar career as both a solo artist as well as performing with a who's who of rock superstars over the years. Rod Stewart and Ron Wood would (Wood-would … now that's kinda cool!) go on to join Faces a couple of years later. While still working with Faces, Rod Stewart would launch a HUGE solo career in 1971 with his #1 hit (the first of four) "Maggie May. In 1976 Ron Wood would join The Rolling Stones. Aynsley Dunbar (who reported lost his spot with The Jimi Hendrix Experience to Mitch Mitchell on a coin toss) would also go on to great success with Frank Zappa's Mothers Of Invention, in addition to playing and / or recording with John Mayall, David Bowie, Lou Reed, Nils Lofgren, Journey, Jefferson Starship, Whitesnake, UFO, Sammy Hagar, Ronnie Montrose, Herbie Mann and several others. The Monkees are in the studio today working on tracks for their upcoming "Headquarters" LP. Mike Nesmith's "You Told Me" and the group effort "Zilch" are the focus of their attention this evening. Meanwhile, a pre-Monkees Micky Dolenz solo single, "Don't Do It", is released in the UK. It will premier on Billboard's Hot 100 Pop Singles chart the following day, eventually peaking at #75. At the ninth annual Grammy Awards Ceremony, Frank Sinatra wins The Record Of The Year Award for "Strangers In The Night" as well as The Album Of The Year Award for "Sinatra: A Man And His Music". John Lennon and Paul McCartney win The Grammy for Song Of The Year ("Michelle") and The New Vaudeville Band win the award for Best Contemporary Rock And Roll Recording for "Winchester Cathedral". At the last minute, Davy Jones stands in for the absent Bob Newhart and ends up presenting two of the evening's biggest awards, "Song Of The Year" and "Record Of The Year". 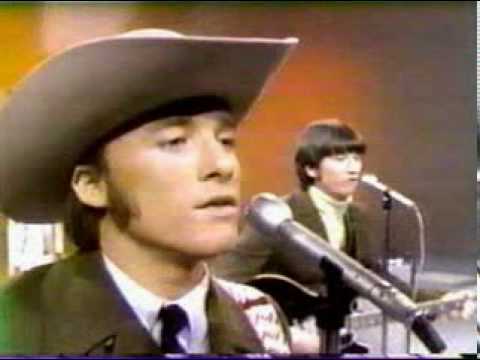 Although The Monkees have two nominations of their own (Best Contemporary Group Performance and Best Contemporary Group Recording, both for their "Last Train To Clarksville" single), Davy goes home empty-handed. Earlier that day The Monkees are in the studio recording tracks for their upcoming "Headquarters" LP. Today, "Randy Scouse Git", a Micky Dolenz composition and the group instrumental effort "Band 6" are worked on. Tommy Roe is back on "Where The Action Is" this afternoon, performing "Kick Me Charlie" and "Everybody". Also on hand … The Young Holt Trio who do their hit "Wack Wack". Other big movers on the chart this week include "The Return Of The Red Baron", up from #82 to #55, a jump of 27 places. (Looks like another big hit for The Royal Guardsmen who peaked at #2 with their debut record "Snoopy Vs. The Red Baron" at the beginning of the year.) Meanwhile, "Jimmy Mack" by Martha and the Vandellas climbs 26 places (from #86 to #60). John Lennon maintained his whole life that the song title was based on a drawing his son Julian did in school and had absolutely NOTHING to do with any sort of reference to LSD, the very popular mind-expanding drug at the time. Lucy was one of Julian's classmates and he drew a rather abstract picture of her. When John saw it, he basically said, "That's lovely son … what is it?" to which Julian replied "It's Lucy in the sky with diamonds". Regarded as one of Lennon's better lyrics (often compared to Lewis Carroll at the time), Paul McCartney later said that several of those psychedelically colorful couplings were his. Johnny Rivers sings "The Poor Side Of Town" on "Where The Action Is" this afternoon. Since they hadn't been paid, Eric Burdon and the New Animals were a no-show at Ottawa, Ontario's Coliseum … causing fans to riot after waiting for an hour for the band to take the stage. Looks like we called this one right last week … as we head into March, The Supremes take over the top spot on this week's Super Chart as "Love Is Here And Now You're Gone" displaces "Ruby Tuesday" by The Rolling Stones after just one week. We've only got two new entries into this week's Top Ten … "Baby, I Need Your Lovin'" by Johnny Rivers jumps from #15 to #8 and "Sock It To Me, Baby" by Mitch Ryder and the Detroit Wheels climbs from #13 to #10. 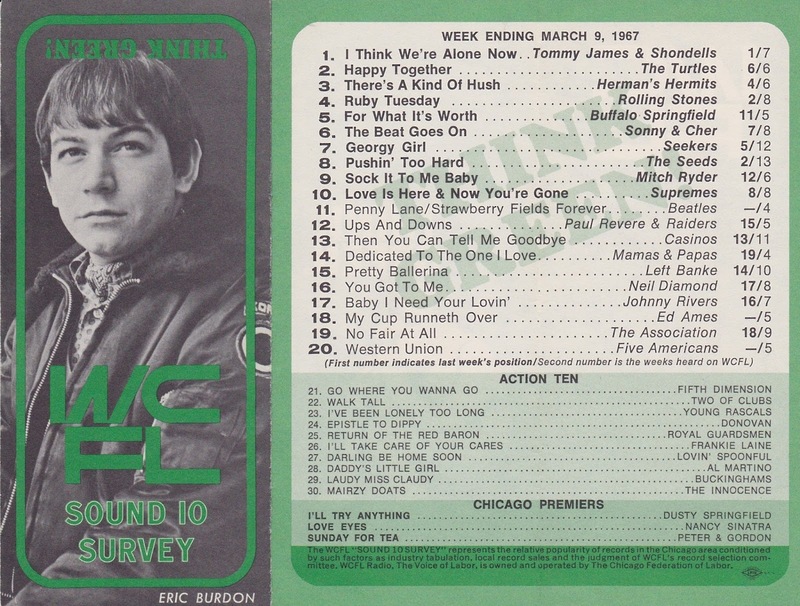 Other bullets within The Top 40 include "Mercy, Mercy, Mercy" by Cannonball Adderley (up from #16 to #12), "My Cup Runneth Over" by Ed Ames (up from #20 to #14), "There's A Kind Of Hush" by Herman's Hermits (up from #33 to #17), "Darling Be Home Soon" by The Lovin' Spoonful (up to #18 from #32), "The Hunter Gets Captured By The Game" by The Marvelettes (up to #20 from #25), "For What It's Worth" by The Buffalo Springfield (up from #28 to #22), "Happy Together" by The Turtles (first week in The Top 40, leaping from #44 to #27), "Penny Lane" by The Beatles, now passing "Strawberry Fields Forever" with a 34 point jump from #62 to #28 ... meanwhile "Strawberry Fields Forever" climbs from #49 to #30 ... "Dedicated To The One I Love" by The Mamas and the Papas" climbs 24 places from #55 to #31, "Niki Hoeky" by P.J. Proby enters the Top 40 for the first time, climbing from #41 to #34, "California Nights" by Lesley Gore is up ten places (from #45 to #35) while Tommy James and the Shondells are up eleven spots (from #48 to #37) with "I Think We're Alone Now". (This record has already hit #1 here in Chicago!) 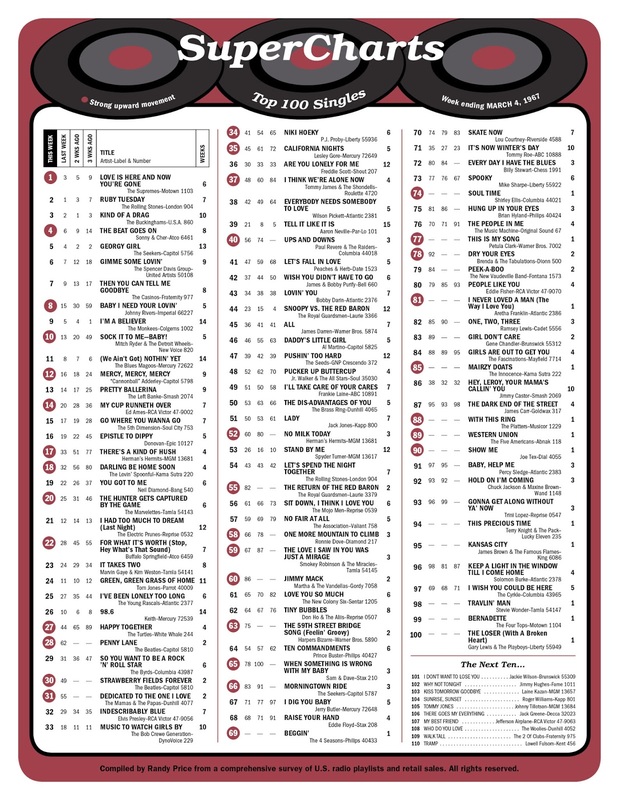 Paul Revere and the Raiders climb 16 spots (from #56 to #40), a great showing after their Top Ten Hit "Good Thing". 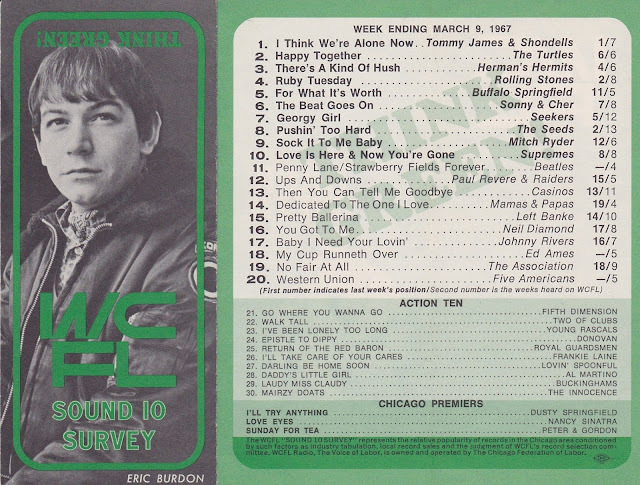 The Monkees continue their run at the top of the album chart as "More Of The Monkees" notches its fourth week in the #1 position. Meanwhile, Don Kirshner is officially dismissed today as music coordinator for The Monkees and head of Colgems Records. This move has been building for some time as The Monkees wanted to assume creative control of their music. Smokey Robinson and the Miracles perform three songs on "Where The Action Is" this afternoon: "The Love I Saw In You Was Just A Mirage", "The Hard Times" and "A Well Respected Man". 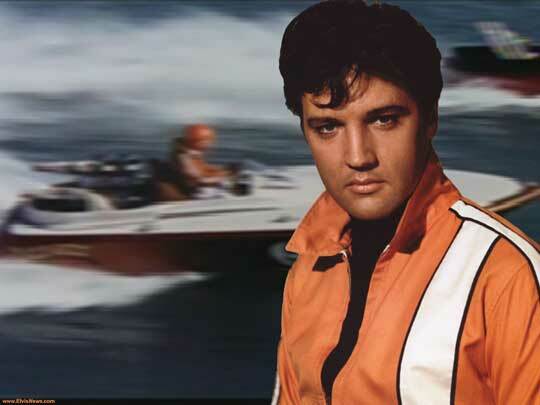 Elvis Presley postpones (for the second time) his trip to Hollywood to begin filming his 25th motion picture, "Clambake". Although he was paid a guaranteed one million dollars for this role, Elvis has been very unhappy with the churn-'em-out movies he's been making and, depressed and distressed at the thought of making yet another carbon copy, has been over-eating regularly. (While on hiatus, his weight ballooned from 170 lbs to over 200 lbs). It also seems that The King has been doing an extensive amount of horseback riding of late, causing him an extensive amount of pain, so on this date, Barbara Little, the girlfriend of Elvis' Memphis Disc Jockey Buddy George Klein, suggests that Elvis call her doctor to help with his saddle sores. It was that appointment that began a doctor - patient relationship that would last until Presley's dying day. The doctor? George Nichopoulos … Dr. Nick … who overfed Elvis a MASSIVE amounts of "prescription drugs" for the next ten years to keep his mood up, down, and occasionally, on an even keel. It gets worse … once filming finally began on March 22nd (after yet another nearly two week delay when Elvis fell in his bathroom causing a minor concussion), Elvis didn't look good in the dailies due to his excessive weight gain … so producers ordered him to lose some weight quickly in order to protect their investment. Enter Dr. Nick to prescribe some "diet pills" to help bring his weight down. To complicate matters further, the film (which opened on October 18th) tanked at the box office … and thus became Elvis' last guaranteed million dollar salary. Although he would make a few more films, it was clear that Elvis' heart just wasn't in it anymore. (Elvis tried a more dramatic role, starring opposite Mary Tyler Moore in "Change Of Habit" a couple of years later but by then music had changed so much that only his most die-hard fans were still buying movie tickets to see him on the big screen.) Thankfully his NBC Comeback Television Special next year would put Elvis back on the Show-Biz Map … it would generate the support of countless new fans, make The King relevant again and launch a series of tours and Las Vegas appearances right up until the time of his death.